With the UK indoor velodrome count still on the rise, along with a number of major track cycling events regularly selling out, it’s good to see more manufacturers cottoning on to the fact that this is a discipline well worthy of investing in with the launch of new models. Mekk is one such firm and has produced two new models that should cover all bases to cope with the increased popularity of track cycling, from newbie to expert. We were invited down to Newport Velodrome to test Mekk’s new entry-level speed machine called the T1, which forms one half of its Pista Series, sitting below the more expensive carbon C1. The company’s move into track cycling was always on the minds of the guys behind Mekk, who have a big passion for racing on the boards. The British brand is the brainchild of Mark Edwards and Ken Knight (MEKK), who between them bring a wealth of knowledge and experience in the race and cycle industry. Mark and Ken wanted to ensure this frame was the best that it could be so development started from the ground up. They say the finished product is the third in its generation since testing, perhaps proving that they didn’t want to produce a go-about-town singlespeed but a true track racing bike. The ideology behind Mekk’s framesets or the ‘chassis’ as Mekk calls it, is that it is the heart of the bike and should be good enough for the top-end as well as the entry-level. This is clearly demonstrated in its road range, with a frame that features from base model through to flagship, changing only the components to match price points in the market. The triple-butted aluminum frame with carbon fork has the “perfect track racing geometry” according to Mekk, which comprises much of what we see already in its competitors. A shorter wheelbase for punchy sprints and a longer top tube to help the roadies’ introduction into track cycling. Super-smooth welding gives the aluminium frame a carbon look, eliminating the ‘pigeon-poo’ weld you see on some alloy frames. The fact that the finishing process for each ‘seamless’ weld takes more than an hour emphasises Mekk’s attention to detail. This, Mekk says, means that customers can buy complete and progress in track cycling without the need to purchase an entirely new bike. So, after much scrubbing in of the new tyres, to ensure no slippage on the boards, we set off, with the pinging of a brand new wheelset settling on its first ride. From the off it was the bike’s effortless acceleration that was most noticeable, which admittedly may have been helped by its low gearing of 48×15. 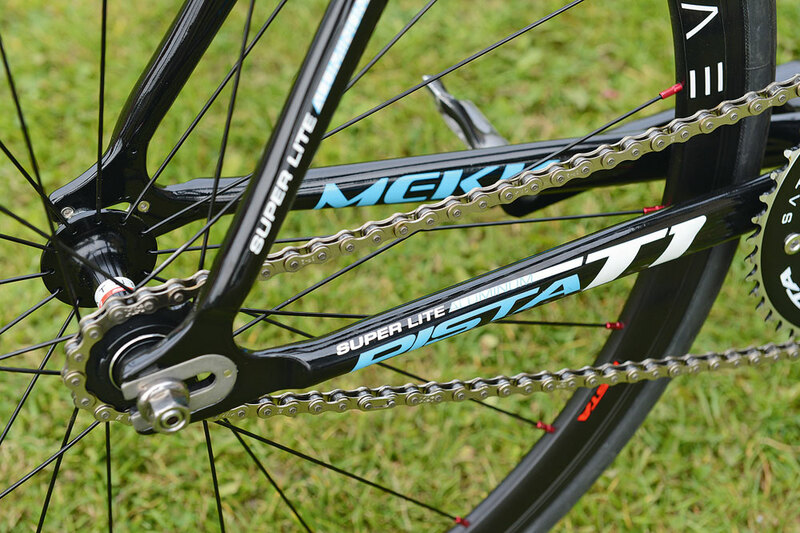 (The bike is supplied with three chainrings: 48/49/50t). Standing starts or rolling at speed, the T1 seemed to be pretty good at forcing you forward. As well as the good speed pick-up, we also enjoyed the agility this frame offers. Easy to flick up and down the banking, but without creating handling that was ever a handful. This good balance and neutral handling gives the T1 the ability to settle down when needed. Taking a lap on a small group or sitting behind the motorbike wasn’t made to be a hell ride, meaning the bike never felt twitchy or unpredictable, an all too common issue in sharp-handling track bikes. 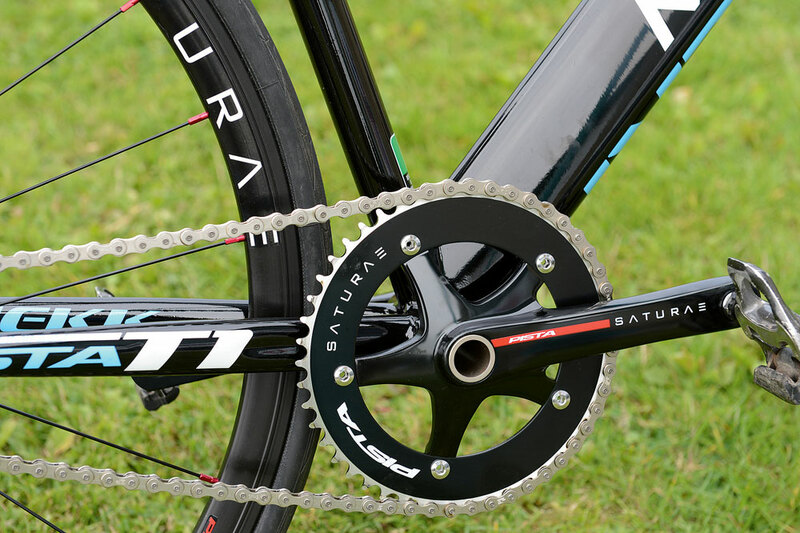 To keep the price down, the bike is features Mekk’s own-brand Saturae components and wheels, including chainset, bars, stem and seatpost. These ran smoothly and didn’t flex as much as we’d thought they might, though neither of us are built like track sprinters! The wheels that were fresh out of the box held firm and met all the demands track cycling brings, rolling well and seeming robust enough to withstand a knock or two. Combining much of what we have seen with the T1, Mekk has produced a top end carbon alternative which completes the Pista Series. 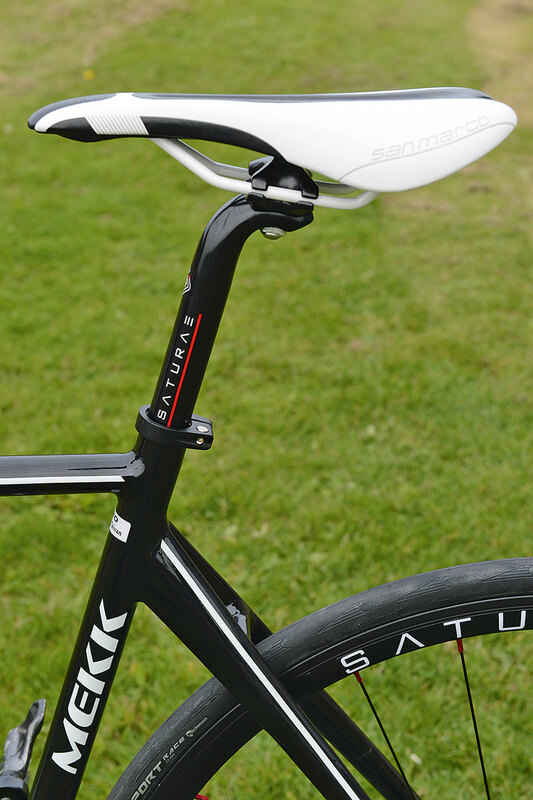 Utilising the aerodynamic properties from its TriPro Carbon, Mekk use an aero-profiled downtube, rear bladed triangle along with a wheel-hugging seat tube and bladed (removable) seatpost. Unlike the T1 the C1 is only available in 52, 54 and 56cm frame sizes but do check geometry, as sizing isn’t standard.